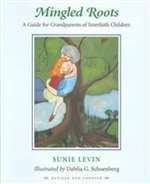 Sunie Levin's thoughtful, sensitive book is for every Jewish grandparent trying to create a meaningful relationship with their interfaith grandchildren. Establishing a meaningful relationship with grandchildren can be hard for any grandparent, especially when physical distance gets in the way. The addition of religious difference can often make the relationship seen even more challenging. Mingled Roots helps grandparent deal with the etiquette of being a Jewish role model while respecting the parents' wishes regarding religion.